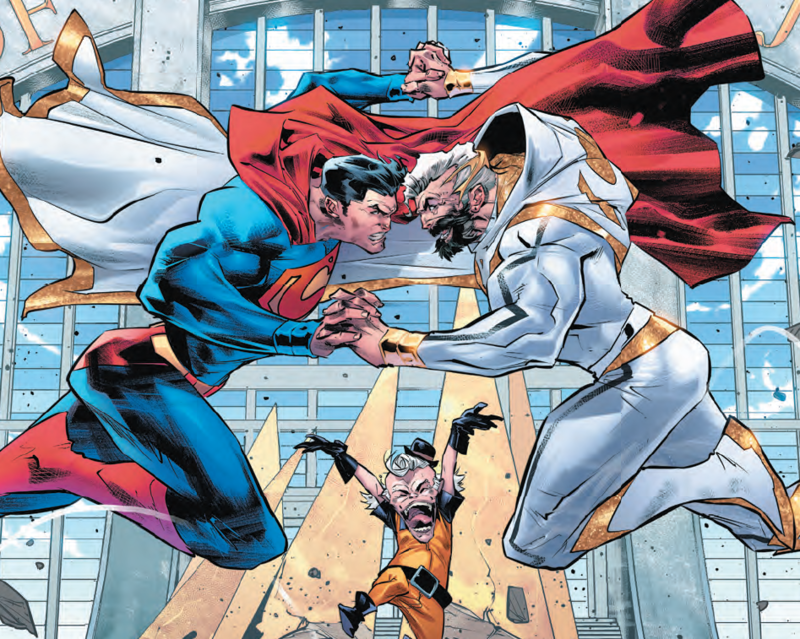 Justice League #20 Review – AiPT! A great issue that begins to reveal what is going on in the sixth dimension. Last issue, the Justice League got a heavy dose of Mister Mxyzptlk, who gave the team new information and also a way to potentially get an edge against Perpetua and Lex Luthor’s plan. It didn’t go well. Today in the second chapter we get a taste of what it’s like in the sixth dimension and it’s quite a trip. Scott Snyder and James Tynion IV are putting out one of the most rewarding comic book reads these days. The scope is huge, the implications of their story deep, and there’s always good character work. Match their work to the stable of artists working on the series and it’s bar none one of the best superhero comics today. Jorge Jimenez is drawing at the highest level based on this and the last issue, too. This issue opens with the Justice League getting a tour of the House of Justice. The tour guide is Superman, a much older version dressed in opulent white as he explains the best course of action for Perpetua. And it’s a shocker of a strategy. This explanation is a clever way to give us new information on Perpetua and practically live through a potential option. It doesn’t seem right though by any means, which is a bit unnerving. If you can’t trust Superman, who can you trust? Much of the rest of the issue checks in on each Justice League hero and their observations of their sixth dimension other selves. There are compliments, there are new understandings, and there is a sneaking suspicion that things are way too hunky-dory. There’s an unnerving nature to all the bright light and positivity as Snyder sets in motion moments where your brain doesn’t want to believe what your eyes are seeing. It’s a good mystery that makes you all the more interested in cracking the code. These reflections of the characters help hold a mirror up to them too, further allowing the reader to probe and explore these characters in a new way. Great stuff. The art by Jorge Jimenez with colors by Alejandro Sanchez and letters by Tom Napolitano is out of this world, literally. There’s yet another great Perpetua double page layout that’s epic and highly detailed similar to last issue, as well as an interesting mix of styles like the use of silhouette and enhance a moment or translucency to feature many Earths in a cool way. Jimenez does not skimp anywhere either, like in a scene with Martian Manhunter who is observing people entering a spacecraft. The craft itself is beautifully designed, but also highly detailed yet it only takes up a quarter of the page. The designs of the sixth dimension Justice League are also incredible. Great stuff all around. The use of color to show futuristic buildings is also impressive. This is an example of good comic writing that doesn’t need action. You’ll be invested in what is going on and what the real truth is to everything and there’s always some new image to observe on every page. That said, I imagine some might be missing action, which is limited here. A great issue that begins to reveal what is going on in the sixth dimension. I’m a sucker for mystery stories like this that probe characters while deliver clues in subtle ways. Like a good David Lynch flick, there’s an unnerving presence you can’t quite put your finger on, further driving your interest and attention. One might call what is going on in the narrative weird, and that’s because it’s a story and approach you don’t see often. A great issue that begins to reveal what is going on in the sixth dimension. Like a good David Lynch flick, there’s an unnerving presence you can’t quite put your finger on further driving your interest and attention. One might call what is going on in the narrative weird, and that’s because it’s a story and approach you don’t see often. Get to know a new kind of Justice League!